The Sticky Buddy easily removes hair, crumbs, lint and so much more! Its rubber fingers dig deep to remove offending particles from carpets, couches, clothes, upholstery or anywhere else it’s needed! 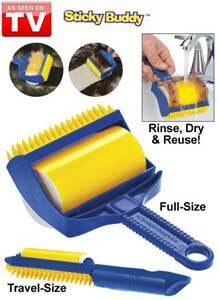 Sticky Buddy cleans in seconds with just soap and water, and becomes sticky to use over and over again!